In this article, we have listed top 10 best TVs under 35000 available in India as of 2019. Top LED TVs of 40, 43 and 49-inch display sizes from brands like LG, Samsung, VU, Intex, Micromax, Onida, Kodak have been listed. Most of the LED TVs on this list have full HD resolution while some of them also have 4K Ultra HD resolution. With the 4K resolution, you get more details and pictures look really sharp. You will see that these LED TVs also have good audio output to deliver an immersive viewing experience. Some of the LED TVs on this list are Smart which means you can connect them to your home or office WIFI and stream videos and movies from the internet. If you have kids then they will love playing games as well. The price of LED TVs on this list is from around Rs. 30000 to Rs. 35000. We have mentioned prices for all LED TVs but the prices keep changing every day so we suggest you to check the latest price by clicking on the buy links provided. In this price range, you can expect large 43 or even 49 inches LED TVs. In this range, LED TVs of big brands like LG, Samsung are non-smart and LEDs from small and new brands like Mi, VU are smart. We like VU LED TVs because of their good quality and low pricing. We have listed a brief overview with specifications and pros cons of every television. Let's take a look at top 10 best TVs under 35000. Sony is a well-known brand across the world. High quality and great after sales service defines Sony. The negative part about Sony is that their products are a bit overpriced but that's something you have to pay for brand and quality. 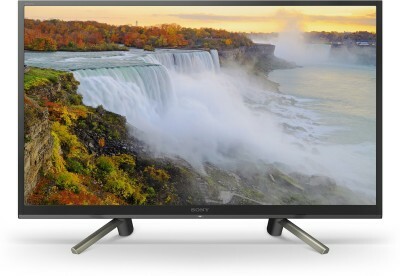 This 32 inch Smart LED TV from Sony is priced under 30000 in India. The display on the front is beautiful with vibrant colors, good contrast, and good refresh rate. The display supports myriad HDR formats, such as HDR10 and Hybrid Log-Gamma. There are 2 HDMI and 2 USB ports available to connect pendrive, laptop etc. For audio it has 3 speakers having 30W sound output with a built-in subwoofer delivers deep bass riffs, soaring vocals, and powerful soundtracks. It is a Smart TV so you can easily connect it to your WIFI at the office or home. It comes with a dedicated YouTube button so you can launch it with just a click. Overall we think it is a great tv but the price is on the higher side. VU LED TVs are our favorites because of their great quality and low prices. This is the latest 2019 Ultra Smart series LED TV from VU costs just under Rs. 30000 and offers a large 49-inch display. The display is bright and sharp with high contrast levels. The A+ grade panel eliminates ambient light reflection ensuring clear, detailed and rich picture quality. The sound is loud and clear and you might not need external speakers. The TV supports DTS-TV and Dolby sound to deliver high-quality sound output. It has features like Tonic Sonics, Total Surround, and Total Volume to offer immersive sound. Another interesting feature is Late Night sound mode with which you won’t lose out on dialogue clarity even when the volume is turned down. It is a smart led tv so you can connect it to your home or office wifi and play videos and movies via the internet. The operating system is Premium Smart OS which works fluidly and has a good UX. You can also mirror your smartphone screen with screen mirroring feature. If you have kids, they will love the Game center which packs up to 30 games. Overall the LED TV works great and is one the best 49 inch led tv under 30000 in India. Samsung LED TV, like LG, cost higher than the brands like VU, CloudWalker but this is because of the build quality and service they offer. This is a 40 inch Full HD LED TV from Samsung and offers great viewing capability. The colours are vivid and bright. On the design side, the bezels are slightly thick on the sides. The sound quality is decent and loud enough for a small to medium rooms. It has 2 HDMI and 1 USB port which will be used for setup box, pen drive or laptop but we believe Samsung should have at least provided 2 USB ports. This is not a smart TV so you cannot use YouTube or Netflix or connect to Wifi, but you can convert it into a smart TV, using Amazon Fire Stick. Overall, a decent option for a Samsung 40 inch LED TV under 40000. 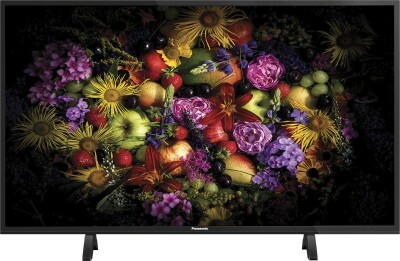 This is a 43 inch LED TV from Panasonic and is priced under Rs. 30000 in India. The build quality of the LED is solid. Pictures are vibrant and have good viewing angles. This Panasonic LED TV comes with Vivid Digital Pro color technology that is optimized for digital signals and noise reduction. This technology helps to offer more natural-looking skin tones, as well as colors. Images also look brighter and sharper. The IPS LCD panel has good viewing angles which mean as many people in the room can enjoy an immersive TV-viewing experience simultaneously. The dual speakers on this LED deliver a sound output of 20 W. They also have the V-Audio technology for an enhanced surround-sound experience. 2 USB and 1 HDMI port are there to connect external devices like a set-top box, pen drive, laptop etc. LG is one of the top brands in India and that's why the LED TVs from LG are expensive compared to other brands like VU, Onida, Micromax. 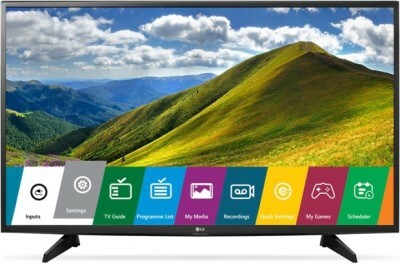 This 43 inches LED TV from LG is the most affordable 43 inch TV from LG. The overall performance of the LED is excellent and you won't face any issues. The display panel is of top quality and sound is loud and clear with decent bass. The TV comes with a sturdy and stable IPS Panel which provides pictures and scenes in lifelike color. Because of the wide-viewing angle and blur-free clarity, it preserves consistency in terms of color and contrast from all angles, even for those fast-moving scenes in action movies and provides a great viewing experience. This LG LED TV has a Color Master Engine which enriches colors, making them feel more vibrant and intense, by adjusting the color saturation, hue, and luminance. The dual speakers on this TV deliver loud and clear sound with good bass. You won't feel the need of external speakers at all. Other features of this LED TV include built-in games which are great for kids, modes like Bollywood mode and Cricket mode which adjusts the settings to provide a better experience. LG has the best after-sales service network across India so you won't face any issues if something goes wrong with your television. Overall, we love this LED TV and we think it is the best-LED TV under 35000 to 40000. Go for it if your budget is around 30 to 40k and need a 43 inch LED of a top brand. So this was our list of top 10 Best TVs under 35000 available in India. We hope it was helpful for our users. If you are wondering which is the best of this list? If you are not a brand savvy, but looking for a best configuration and specifications then you can go for VU 43-inch Ultra HD (4K) smart television. It will cost under 30000.